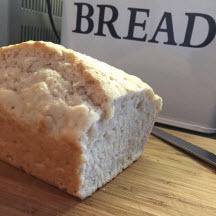 This is the easiest, quickest loaf of bread you'll ever make, yet it almost has the texture of yeast bread. In a mixing bowl, stir together the flour and sugar using a fork, make a well in the center and add the beer, stir with fork until well combined. Scrape batter into the prepared loaf pan; cover with plastic wrap and set aside while the oven preheats.